Having food allergies means always doing your best to stay safe and to be prepared. But what happens when suddenly, there is a major event that causes that sense of safety to quickly turn back into that fear that took you so long to shake off? 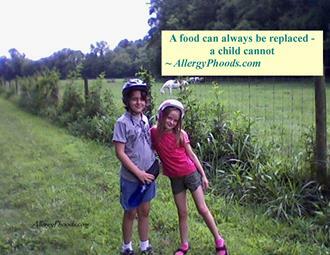 Food allergy families are told to always be prepared even before you need to be prepared. And, most of us are until the very item that keeps us safe has now become invalid. Total Recall Recently, there was a recall of all Auvi-Q auto-injectors. ALL, not some. This means that anyone and everyone who got used to the smaller, self-talking epinephrine injector no longer had an option or choice in preference. Now, it’s all about what is necessary to protect lives and to prevent allergic tragedies rather than what will fit better inside of your purse or your pocket. Even though it seems that the majority of families tend to have both an Auvi-Q and an EpiPen, many of us were quickly reminded that life with food allergies should not be about comfort but about safety. Restock Then, there was widespread panic that pharmacies would not be able to stock enough EpiPens in light of this recall. Imagine sending your child, your loved one, your co-worker off without any epinephrine and hoping that they would be safe for that day. Imagine revisiting that helpless feeling of “what if” while you wait for the new batch of EpiPens to arrive at your pharmacy. Before the recall, all of us felt that we were prepared. All of us felt that cushion of safety that was with us. It seemed so much easier for us to use as well as for others who don’t know how to administer epinephrine. Luckily, we were quickly reassured that EpiPens would not be in short demand. We all exhaled just a bit. Extra Help In the midst of the epinephrine disorder, there is still exciting news that I feel will help us all feel a little calmer and focused on what is important. 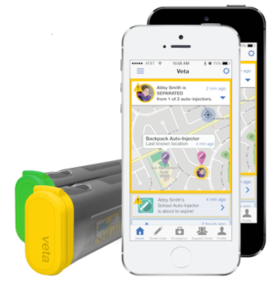 Veta Smart Case A case that does everything that we have been asking about for our auto injectors. Some of the features include tracking your epinephrine, alerting you when you become separated from the container, a temperature change (if you leave it in the car) and when it’s opened to be used for an allergic reaction. It’s like a watchdog for your auto injector. Intrigued? Luckily, I was able to meet with the company representatives and you can see a demonstration here. You may also pre-order yours by going to Aterica’s website. No matter what obstacle is placed in our way, always remember what is truly important. 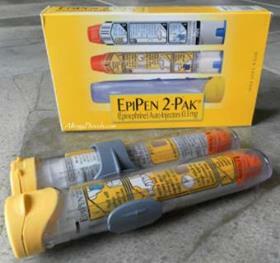 The food allergy community still has epinephrine to stay safe. Our families may be a bit touchier about the transition back to a different auto injector but they will get over it. Our doctors, family members and anyone else who has touched our lives will realize that food allergies are that important to understand. Remember that being prepared does not always mean feeling a little more stylish or a little less obvious about your food allergies. The one time that you need that epinephrine, the one time that you realize what has happened from a dangerous food- that will be the moment that you remember. It won’t be the type of package that life-saving auto injector is- it will be that you are alive.